SuperScript is the ideal solution for performing a Question and Answer routine based on a believable premise: graphology and handwriting analysis. You'll need no clipboards or impression devices nor will you be required to do any 'pre-show' work. The method is clean, can be performed close-up or on the largest stage, and leaves a souvenir brochure in the hands of everyone whose question is answered. 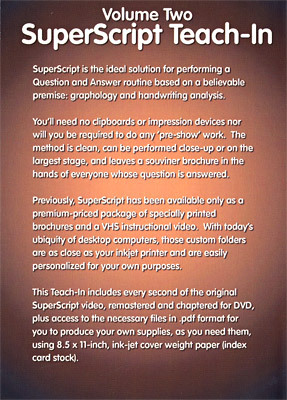 Previously, SuperScript has been available only as a premium-priced package of specially printed brochures and a VHS instructional video. With today's ubiquity of desktop computers, those custom folders are as close as your inkjet printer and are easily personalized for your own purposes. This Teach-In includes every second of the original SuperScript video, reemastered and chaptered for DVD, plus access to the necessary files in .pdf format for you to produce your own supplies, as you need them, using 8.5 x 11-inch, ink-jet cover weight paper (index card stock).